Broken Eye Books, 9781940372273, 98pp. Lolo's memories aren't what they used to be. What's real? What's just dream? She can't say, but she's sure there used to be more. Who are these Caretakers? Where's her family, her sister? What happened to the world? So many questions. Time to find answers. Words. Memory. Identity. They came. And they took away our story. And they rewrote everything: all minds, all lives, all history. Everyone forgot. But in this now, Lolo must reclaim her stolen words--her stolen family--from the silent Caretakers. She must call out to all rapt children, "This world is hell. Let's run." When the words needed are forgotten, lying unknown, when memories flit like smoke, how can she recover what is lost? She must. To live in this nightmare without a story would be too much to bear. 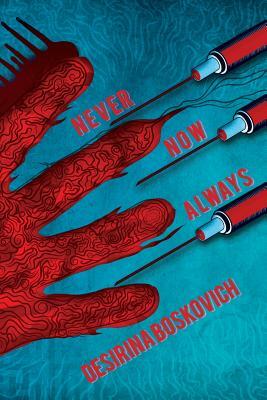 NEVER NOW ALWAYS is a weird sci-fi novella that explores how the stories we tell about ourselves shape us and those around us. It's a chilling and thoughtful look at the thin line between memory and dream and the drive to find family.